Postpartum depression (PPD) is a mood disorder that affects women after childbirth. This long-lasting form of depression impacts a mother’s relationship to their newborn baby and impacts their physical and emotional health. Postpartum depression can occur with any mom, first-time or not. How common is postpartum depression? According to the CDC, about 1 in 9 women experience symptoms of postpartum depression. With approximately 4 million live births occurring in the U.S., approximately 600,000 individuals are diagnosed with postpartum depression. Additionally, the American Psychological Association reports that for half of women diagnosed with postpartum depression, this is their first episode of depression. At the Phoenix Recovery and Counseling Centers, we offer individualized treatment programs for mental health disorders, including treatment for postpartum depression. In addition, we know and understand the science of chemical dependency with its associated neurological changes and its impact upon the pleasure system, emotions, learning, memory, motivation, and most importantly, the ability to exercise choice. We know and understand the biological and psychological science that support treatments in trauma, emotional disorders, and other mental health concerns. Below is information relating to postpartum depression and our treatment programs. Postpartum depression is a type of mood disorder that affects women after giving birth. 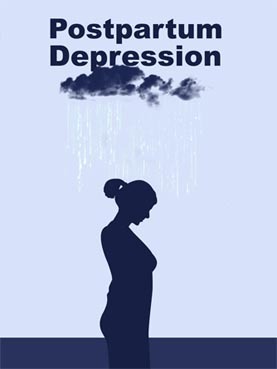 Women experience extreme symptoms of depression that last longer than more common “baby blues.” Moreover, postpartum depression affects a woman’s ability to care for not only herself, but her newborn baby and family. Unfortunately, postpartum depression can go undiagnosed in women. Moreover, it’s important to note that baby blues is a separate condition from postpartum depression. Baby blues occurs after the birth of a child and is caused by the heightened stress of taking care of a newborn baby. According to National Institute of Mental Health, up to 80 percent of mothers experience baby blues. With baby blues, the stress, fatigue and emotions are mild and last for a couple of days to a week or two. Unlike postpartum depression, the blues go away on their own. What causes postpartum depression? Numerous factors play a role in postpartum depression, including women experiencing lower levels of estrogen and progesterone after childbirth and emotional factors from taking care of a newborn. It’s important to note that not every woman with postpartum depression experiences every symptom listed above. Additionally, only a healthcare provider can diagnose postpartum depression. What is Postpartum Depression Treatment and What Does That Look Like at PRC? There is no one-size-fits-all treatment when it comes to postpartum depression but it is treatable through the right programs. Typical treatment for postpartum depression includes cognitive behavioral therapy (CBT), prescription medications, self-care, and outpatient programs. These programs are effective alone or can be combined. At the Phoenix Recovery and Counseling Centers, we offer mental health services and specifically treat those suffering from postpartum depression. Our services include a PHP Day program, Intensive Outpatient program and general outpatient program. Furthermore, the Phoenix Recovery and Counseling Services provides support for patients in finding the right residential care with one of our community partners. Click on each service to learn more about what they entail and how they can help you on a path towards recovery. Patients and families who engage in The Phoenix recovery experience through our continuum of care, learn and develop both recovery and disease management skills. Moreover, patients and family members begin to identify, define, and achieve stability in their pursuit of a meaningful life. As a result, self-confidence embodies the emotional and cognitive condition of our patients and family members. Patients and their family members enjoy relationships that begin to be healed. They also celebrate the fact that dreams are being redefined through realistic applied behaviors that are motivated by meaning pursuits supported by recovery based support systems. In addition, the staff at the Phoenix Recovery Center is passionate about total behavioral health in overcoming addiction. They deeply care about each person who they work with. Often our alumni comment on the profound impact of our staff members in encouraging them on their path to living a fulfilling life. Those who come to The Phoenix Recovery Center can realize a rebirth of their own dreams as they achieve their own sobriety and much, much more. And that makes all the difference. The Phoenix Difference constitutes a carefully tailored program and recovery experience defined by research. Every effort is directed at supporting outcomes that prepare patients and their families with both the knowledge and applied behaviors to manage mental health disorders and to reclaim a meaningful life. Furthermore, the Phoenix Recovery and Counseling Centers are driven by the guiding mission statement: “Empowering individuals and families suffering from addiction and mental health disorders, to celebrate life through lasting solutions.” We accomplish the therapeutic and healing experience through a continuum of care that begins with Residential Treatment and traverses across a Day Program, Intensive Outpatient (IOP), to General Outpatient (GOP). Lastly, the continuum of care culminates in a weekly Alumni Support Meeting, which provides a recovery support community to sustain the recovery capital of The Phoenix Alumni.